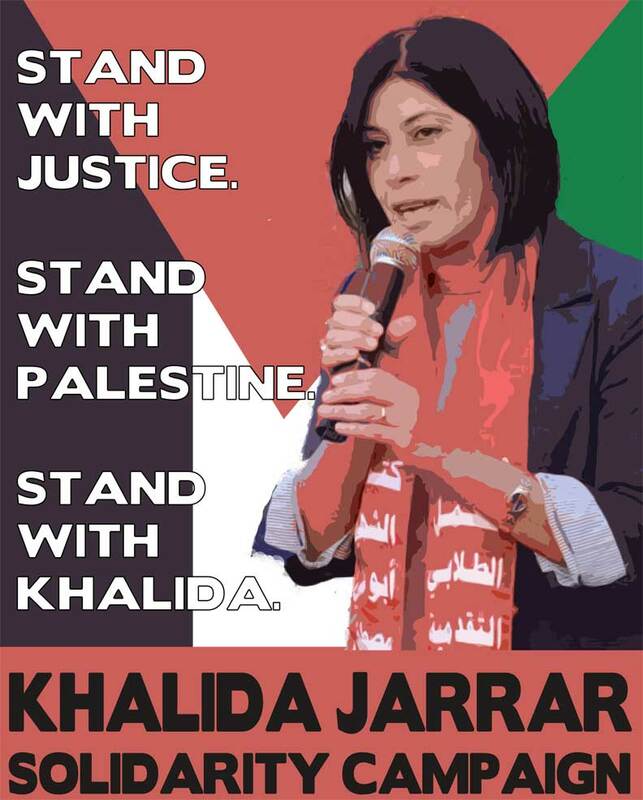 Over 2000 (updated September 16) organizations and individuals from around the world expressed their support for Palestinian political leader and parliamentarian, Khalida Jarrar, in a public statement on August 26 from the Khalida Jarrar Solidarity Campaign. Jarrar’s Ramallah home was raided by dozens of Israeli soldiers at 1:30 am on August 20, who delivered a military court document ordering her forcibly transferred from Ramallah to the city of Jericho. Over 100 international, Palestinian and Arab organizations based in North America, South America, Europe, Asia, Africa and Australia signed the statement demanding the immediate cancellation of the expulsion order. Over 900 individuals, including noted jurists, scholars, political figures, lawyers, writers, students, labor, women’s and human rights advocates, joined the call (see below for complete list). Jarrar has refused expulsion to Jericho. Instead, she has set up a protest tent in the Palestinian Legislative Council courtyard in Ramallah, where she is living and working until the order is lifted. “It is the occupation who must leave our homeland,” said Jarrar. Jarrar, elected in 2006 to the Palestinian Legislative Council, is a well-known feminist, prisoners’ rights advocate, and leftist, a leader in the Popular Front for the Liberation of Palestine. She has been actively participating in mobilizations in the West Bank against the ongoing Israeli aggression on the Gaza Strip, which has killed over 2,100 Palestinians. 36 members of the Palestinian Legislative Council are held in Israeli prisons, most of them in administrative detention without charge or trial. Three Jerusalemite PLC members, and one former minister, were stripped of their Jerusalem IDs by Israeli orders before their arrest. The use of internal forced transfer within the West Bank recalls forced deportation and transfer practices used against Palestinian mayors and other leaders in the mid-1980s by the Israeli military occupation. Thousands of letters of protest have been sent online to Israeli officials from all areas of the world, demanding the cancellation of the expulsion order. The order violates the Fourth Geneva Convention, which prohibits forced transfer of individuals in occupied territory, as well as the Universal Declaration of Human Rights. The Khalida Jarrar Solidarity Campaign welcomes additional organizational and individual endorsements on the following sign-on statement. 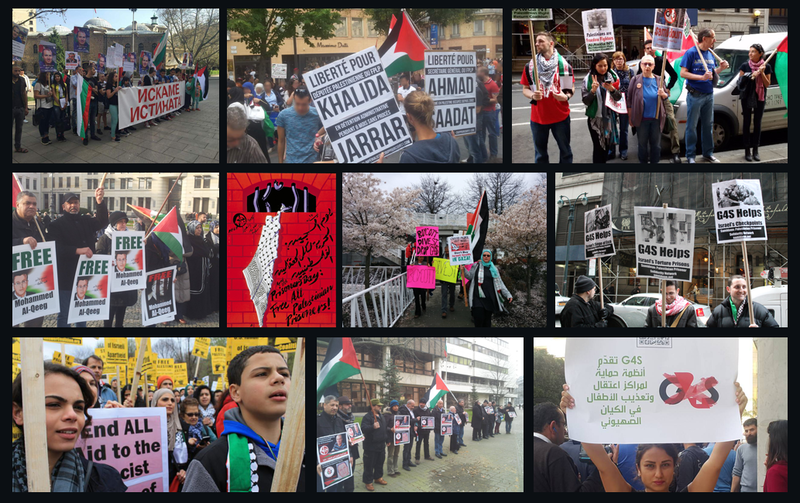 Please sign the statement below – the stronger the visibility of international support for Khalida, the stronger our call will be to cancel the expulsion order! Please use the form below or email standwithkhalida@samidoun.ca. We, the undersigned organizations and individuals, write to demand the immediate cancellation of the expulsion order against Khalida Jarrar, Palestinian Legislative Council member, prisoners’ rights activist and political leader. On August 20 at 1:30 AM, Ms. Jarrar’s Ramallah home was raided by 50 Israeli occupation soldiers who presented her with a “special supervision order,” written in Hebrew and read aloud in Arabic. This military order, signed off by an Israeli military court on the basis of unspecified and secret evidence, orders Jarrar expelled from her Ramallah home and forcibly transferred and confined within the city limits of Jericho for an initial period of six months; it was deemed effective within 24 hours. This order is a blatant injustice and is part and parcel of the ongoing Israeli occupation attempt to silence the voices of Palestinian political leaders and to confine and expel Palestinians. From the expulsion of over 750,000 Palestinians from their homeland in 1948 – including members of Khalida Jarrar’s family – and the denial of their right to return for over 66 years; to the attempted deportation of Palestinian mayors outside Palestine; to the stripping of the Jerusalem ID’s of elected PLC members Mohammad Abu Tir, Ahmad Atoun, Mohammed Totah and Khaled Abu Arafah; to this expulsion order, there is a long line of Israeli attempts to threaten Palestinian life through displacement and expulsion. Khalida Jarrar has refused to sign the expulsion order, saying “you, the occupation, are killing our Palestinian people. You practice mass arests, demolish homes, kidnap people from their homes and deport them. It is you who must leave our home.” She has moved to stay in a “protest tent” outside the legislative council building in Ramallah. She announced that she is going to stay and continue her work from there until the decision is revoked. Jarrar is a Palestinian political leader in the Popular Front for the Liberation of Palestine, a Palestinian Leftist party; she is a frequent leader and participant in demonstrations and popular actions for Palestinian freedom. She is a long-time Palestinian political prisoners’ advocate, former executive director of Addameer Prisoner Support and Human Rights Association and a member of its board; she chairs the Prisoners’ Committee of the Palestinian Legislative Council. She is also active in the Palestinian women’s movement from her earliest days as a university student organizing with other women students to challenge the occupation. A feminist and prominent voice for the defense and expansion of women’s rights, she is a leading organizer of International Women’s Day events in Palestine and coordinates closely with Palestinian women’s organization. “Palestinian women are full partners in the Palestinian struggle,” she emphasizes. It is clear that Khalida Jarrar is being targeted in order to suppress Palestinian political organizing – particularly as she has been a visible and prominent participant in the West Bank demonstrations in support of Palestinians in Gaza, denouncing the occupation military’s killing of over 2,000 Palestinians. Khalida Jarrar has been targeted for an expulsion order because she is a Palestinian woman, a Palestinian parliamentarian, and a Palestinian leader. Today, we stand with justice, we stand with Palestine, and we stand with Khalida to demand the immediate cancellation of the “special supervision” expulsion order. Thanks to all for your support! Khalida has achieved victory and the expulsion order is no longer in effect! Peter R Lake, P.Lake and A.Wilhelm MDs Inc.
Sept. 2, Detroit: Rasmea Odeh's next court date: All Out!